No prior experience is required. 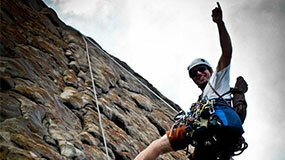 We can cater for all levels, from complete beginners to the experienced, in abseiling, rock climbing and caving. Is there an AGE LIMIT to be able to participate? We like to assess the maturity of kids, and prefer they be over ten and must be accompanied by an adult. There is no age limit for ‘grown-ups’, providing you are of reasonable health and fitness. I am on my own, can you take just ONE PERSON abseiling? Yes, I can take just one person, however there is a minimum charge that applies. I don’t have TRANSPORT, am I able to be picked up from my accommodation? Yes, just let us know when you’re booking and we’ll arrange it. Water, hat, sunscreen, wet weather gear in case of inclement weather. We provide a simple morning or afternoon tea – please let us know if you have any particular dietary requirements or allergies. (NB: I have a first aid kit, but you will need to bring any medication you require). Comfortable clothing and good enclosed walking/hiking shoes. If you are unable to attend and if 24 hours or more notice is given, I am happy to transfer your adventure to another date. Cancellations within 24 hours may attract a cancellation fee.